Bernie Kosar has proven himself to be a better quarterback than businessman. Kosar has filed for bankruptcy after bad investments have landed him in over $19 million in debt. 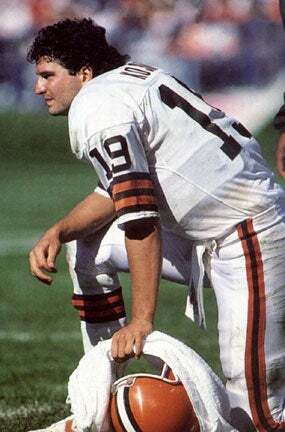 Kosar owes almost $1.5 million in "unsecured debt" to the Cleveland Browns, who he played for from 1985 to 1993. Kosar also owes his ex-wife Babette $3 million and $725,000 (from a personal loan) to the owner of the Cleveland Gladiators of the Arena Football League. He owes a bank more than $9 million for bad real estate deals. You know you're screwed when two of your biggest creditors are your ex-wife and your former boss. A statement released by his lawyer blames the bad economy. ''His misplaced trust and reliance on those close to him to manage his businesses and finances along with the global recession has been the impetus of this last resort,'' the statement said. His ex-wife tells it a little bit differently. If generous=foolish, then I'd say he's about right. This is just another example of athletes not taking the initiative to learn about their own finances. Do your homework, utilize trustworthy financial advisers and pay attention to where your cash is going. And never ever let your ex-wife see you giving money to charity that could be used for her botox injections.